Peter Jackson is ready to present the first official trailer for the long-awaited first part of the hobbit saga The Hobbit: An Unexpected Journey. The trailer begins with a scene of Bilbo and Frodo (Ian Holm and Elijah Wood) discussing Bilbo’s journey with maybe some details of it getting left out at the time. 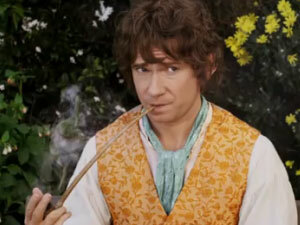 The story has got to be told anew, and we see young Bilbo, played by Martin Freeman, being enticed into an adventure by Gandalf the Gray (Ian McKellen). While Bilbo is still in a dither over the prospect, a host of Dwarves descend on him headed by Thorin Oakenshield (Richard Armitage) who start upon an entrancing chant while short episodes of what is to come flicker away on the screen. We get a glimpse of a spectral Galadriel played by Cate Blanchett and a nasty Gollum (Andy Serkis) craving for his lost treasure. After Jackson’s three-part rendering of J.R.R. Tolkien’s trilogy The Lord of the Rings brought him 17 Oscars, innumerable fans across the globe and critical recognition, it’s only natural that he should turn to The Hobbit – but this one is coming out in an atmosphere that has a different feel. Bilbo’s journey occurs 60 years prior – and bear a direct influence – on what is evolving in the trilogy and follows a brave attempt to regain a treasure heap and a lost kingdom by bringing down the dragon Smaug. In a purely accidental episode – while enduring the hardships of the way and fighting off goblins, wargs and other evil creatures – Bilbo takes possession of a ring following his meeting with Gollum, an occurrence that set off the war depicted in The Lord of the Rings. The fans of Jackson’s previous masterpiece will be glad to see the actors involved in the first three films back in their roles: Elijah Wood (Frodo), Andy Serkis (Gollum), Ian McKellen (Gandalf), Cate Blanchett (Galadriel), Orlando Bloom (Legolas), Christopher Lee (Saruman) and Hugo Weaving (Elrond). The Unexpected Journey comes in two films, hitting the theatres in December 2012.